3/7/12 - Acquisition - Waddesdon, Waddesdon Manor - Built by Ferdinand de Rothschild between 1877 and 1883, Waddesdon Manor and its collections were bequeathed to the National Trust in 1957 by James de Rothschild and still benefit from the family’s generosity thanks to a charitable trust. The trust has just acquired a painting representing The Allegory of the Exile of the Duke of Choiseul by Anicet-Charles-Gabriel Lemonnier from the Talabardon-Gautier Gallery in Paris which will join the collections at Waddesdon Manor. The work is described in a text inscribed in the lower half : "A great man is leaning on Innocence/Jealous Fury, awful Calumny, return to court among his enemies/and the memory of his life/can add beauty to his saddest of Stays." 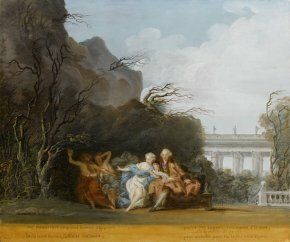 Etienne-François, Duc de Choiseul, was exiled by Louis XV to his estate in Chanteloup, not far from Tours, where he lived out the rest of his life and the setting for this scene represented in the painting (the colonade at the back of the garden is still recognizable). The artist is obviously supporting Choiseul, speaking outagainst the enemies who caused his downfall. The Rothschilds held many objects from the duke’s collection, notably the Van Blarenberghe snuff box describing the interior of his private residence in Paris. In 2008, Waddesdon Manor had acquired, again thanks to the Rothschild trust, the portrait of the duke by Adelaïde Labille-Guiard.